Should Carson Wentz start Week 1 for Eagles? Did you hear the news? The Eagles traded starting quarterback Sam Bradford to the Vikings! That, of course, leaves the Eagles with Chase Daniel and Carson Wentz as the remaining quarterbacks on the roster. In the aftermath of the trade, the obvious next question is of course, "So how long until Wentz becomes the starting quarterback?" Back in 1999, after rookie head coach Andy Reid drafted Donovan McNabb with the No. 2-overall pick, Doug Pederson started nine games before giving way to McNabb for the rest of the season. Pederson had previously played under Reid in Green Bay, where Reid was Pederson's quarterback coach. That situation has now come full circle, as Pederson, now a rookie head coach with the Eagles, has a quarterback of his own in Carson Wentz who was also drafted No. 2 overall, and an inexperienced but familiar face in Daniel, who followed Pederson to Philly from Kansas City. All throughout OTAs, minicamp, training camp, and the preseason, Daniel has been the immediate backup to Bradford, and Wentz very clearly the No. 3. However, Wentz has clearly shown (in my view, anyway) that he is already a better quarterback than Daniel. It's only a matter of time before Wentz becomes the Eagles' starting quarterback this season. The question is not "if," it's "when." Wentz injured two ribs in the first preseason game, and missed the next three while recovering. Has he shown the Eagles enough to be thrown to the wolves Week 1 of the regular season? Has the offense around him proven that they're all on the same page? Will offensive line continuity (or lack thereof) give Pederson pause, in fear that the line is not yet ready to protect the franchise's most valuable asset? Those are all good reasons not to start Wentz Week 1. On the other hand, the Eagles have maintained all offseason that they want to win in 2016. It is my belief that Wentz gives them the best chance to do so, even in first game of the regular season. The Eagles could play it safe and let Wentz continue to develop behind the scenes, or they could just say "Screw it, get in there, kid," assuming Wentz's rib is fully healed by September 11th. I lean toward the latter. 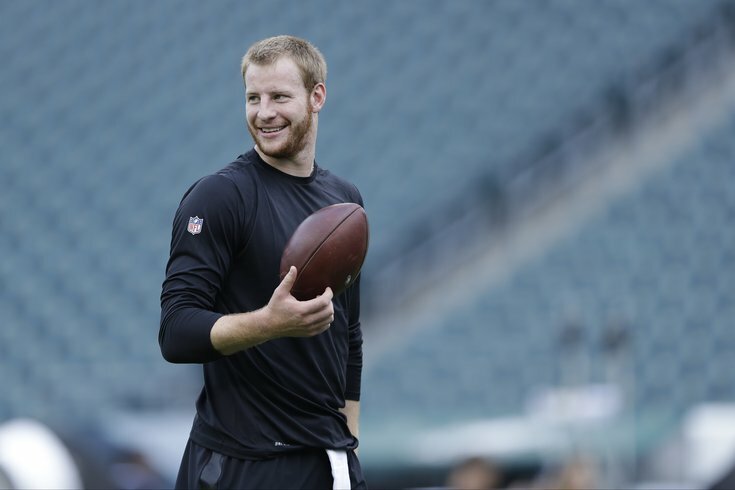 Should Carson Wentz start Week 1?